This model has been reduced to half natural size, permitting it to easily fit just about anywhere. In spite of its small size, it has all the functionality of the life-size models described below. 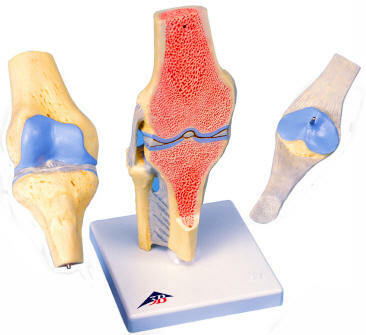 This superbly detailed model features a joint cross section mounted on the base which may be used to explain what is happening within the joint. This life-size flexible joint may be used to demonstrate abduction, anteversion, retroversion, internal rotation, external rotation and more. Great for patient education. 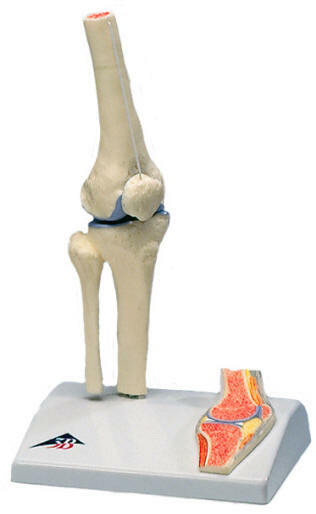 This model shows a natural size healthy right knee joint in upright position including parts of the femur, tibia and fibula as well as the ligament system and the patella with parts of the femoral tendon. 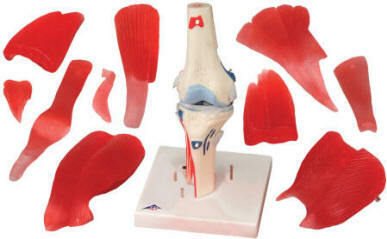 The patella, attached tendon and the front half of the model (which is frontally sectioned) can be detached to reveal the internal structure. Mounted on base.. 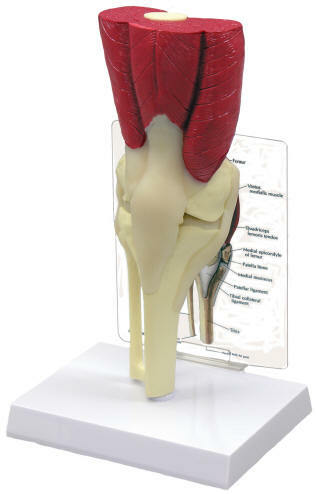 This 12 part model shows different removable muscles and muscle portions of the knee area. Color coded with raised areas indicate the muscle origin and insertion points on the femur, tibia and fibula. Plus part of the fibular and tibia collateral ligaments are represented. 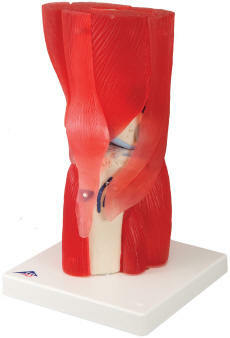 All of the muscles are easily removable to permit study of the deep anatomical layers.